Chances are you have clicked through to this page from my Twitter profile where I am known as Fattymustrun. I gave myself that Twitter handle not because I hate myself and feel like punishing myself every time I go for a run, but because when setting up my account The Fat Girls Guide to Running was too much of a mouthful with only 140 characters to play with, so instead I thought back to the time a little 8 year old boy shouted “Fatty” at me as I huffed and puffed around a 3k fun run. You can read all the embarrassing detail in a post called Why Fatty Must Run if you like. Basically this is where @fattymustrun was born. In real life though I am better known as Julie Creffield author of the books 10K: How to train for a 10K in only 10 weeks and How to get past the first 30 seconds, both available to purchase from Amazon for less than a price of a Big Mac Meal. The Fat Girls Guide to Running website started back in 2010 as a personal blog following my journey from beer guzzling, cheesecake eating party girl to sub 6 hour marathon runner. Yes, I actually run a whole marathon, the London Marathon in 2012. Somewhere along the way the word got out and other “FAT” runners got in touch and started sharing their store with me and bit by bit the blog has turned into a resource for other plus sized runners. My mission is to get 1 million overweight women running as part of #onebigfatrun my FREE virtual 5K which takes place on the last Sunday of every month. I want to show YOU and the rest of the world that FAT GIRLS CAN RUN TOO. In fact I want to prove that anyone can run and should run, and not only for physical health or weightloss reasons but basically because it makes you feel absolutely incredible…well once you get past the first 30 seconds that is. 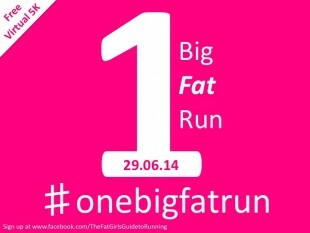 So why not take the first step and sign up to #onebigfatrun today and join our Facebook Community Page. My goal is to create a website that inspires, motivates and amuses you in equal measure. I hope you find all the information you need as a plus sized runner to get you out that front door and literally pounding the streets with the best of them. If there is something missing, or something you specifically need to know, then do let me know. I typically post three to four times a week, but this is dependant on whether I have been out for run or not…NO Running = NO BLOGGING, so you can see how this blog motivates me to get off my backside and get moving. To make sure you don’t miss my newest posts, you can subscribe via RSS or e-mail. If this is the first time you have visited my site, let me give you a heads up and pass you on to my most popular posts. Whats so bad about coming last? What do you mean you could never run a marathon? Does being poor = being obese? Julie Creffield is a writer, project manager and entrepreneur from Stratford in East London. She has lived in the East End of London for most of her life and has a sharp eye for a juicy project or a funny angle on a story. She says “I have always been a writer. I used to copy the letters off the SMA tins at nursery until the teachers realised what I was doing and gave me a book to copy from instead. I progressed to keeping diaries and writing short stories in my teens just to make my mum fret and my teachers laugh. Twenty years later I still haven’t shook off my desire to write”. Julie has had a colourful working life as a theatre usher, salad packer, barmaid, youth arts worker, cultural facilitator and trainer. She has spent the last 8 years however working in various capacities on the London 2012 Olympic & Paralympic Games which took place literally yards from where she lives with her fiancé Fabian (who is also a writer) and young daughter Rose. 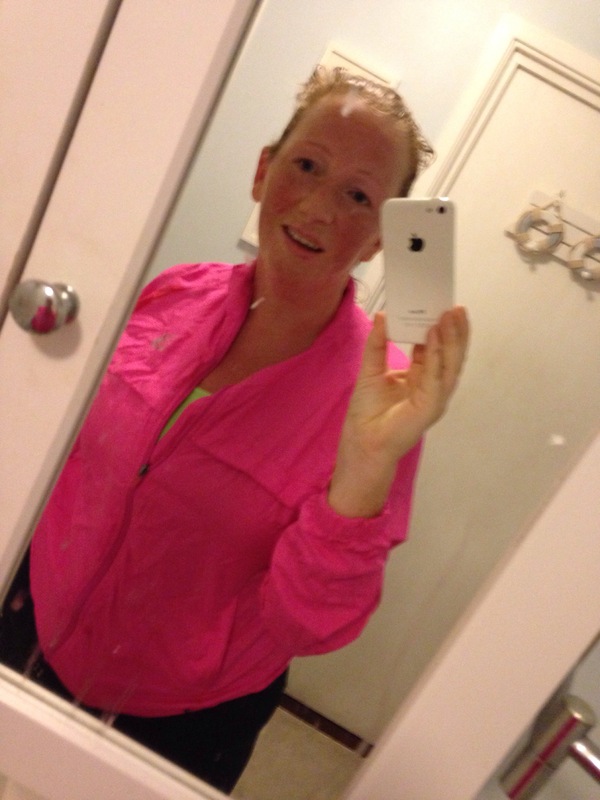 Julie is best known for her humorous writing about the issues facing plus sized runners and is the brains behind the successful blog http://www.thefatgirlsguidetorunning.com, where she supports plus sized runners from across the world, but she is also a freelance journalist, and short story writer too. That’s great, all publicity is good publicity! !